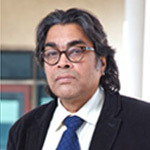 Shubhashis Gangopadhyay did his PhD in Economics from Cornell University, Ithaca, New York, USA. He joined the Delhi Centre of the Indian Statistical Institute as a lecturer in 1983. He became a full Professor in 1991. He took over as founder-director of IDF in July 2002. He has published widely in journals on development economics, international trade, industrial organisation, regulatory economics and finance. He has also co-authored and co-edited a number of books in economics and finance. He is the Chief Editor of the Journal of Emerging Market Finance and is the President of two professional societies, the Society for Economic Research and Financial Analysis (SERFA) and the Society for the Promotion of Game Theory and its Applications (SPGTA). He has been on many government committees and consulted with various ministries and private business.